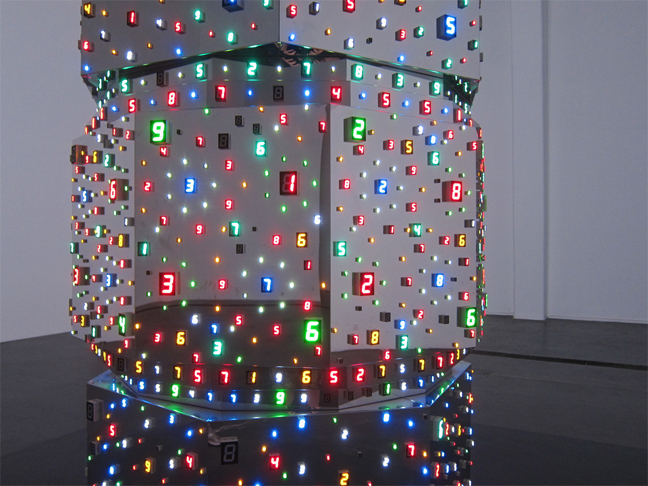 Lisson Gallery presents its third solo exhibition of Japanese artist Tatsuo Miyajima (27 September – 2 November 2013), an immersive and interactive installation comprising three new bodies of work based on his ongoing use of numerical displays constructed from light-emitting diodes (LEDs). 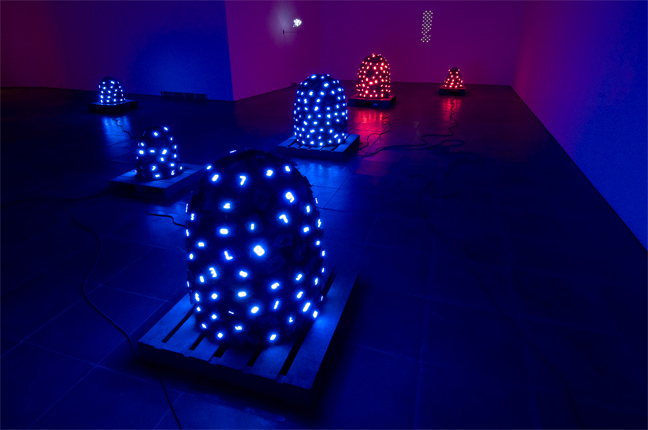 The show’s title, I-Model, refers to Miyajima’s collaboration with an artificial life expert, Professor Takashi Ikegami of Tokyo University, which has resulted in a computer programme that generates number sequences responding to the rhythms and speeds of others in the system. 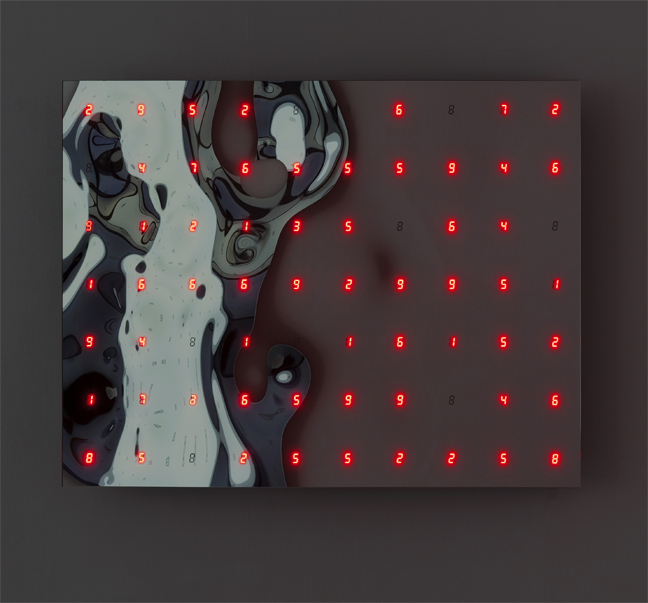 Instead of a collection of randomised counting circuits, these networks or clusters of flashing digits come together to create intelligent, ‘living’ organisms, which Miyajima calls Corps Sans Organe after Antonin Artaud’s term for an ideal, virtual body that could function independently from the interconnectivity of its constituent parts. 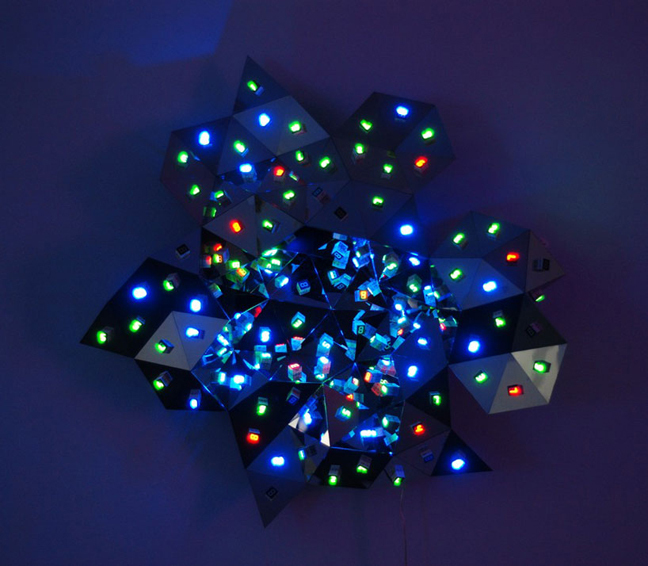 The Rhizome series (all works 2013), are similarly complex and hypnotic works, formed of glittering grids or panels of coloured LED numbers, also following Ikegami’s unpredictable logic processors. Lisson Gallery is also debuting Miyajima’s seductively red leather-clad structure, Life Palace (Tea Room) (2013), which occupies an entire gallery and invites one viewer at a time to step into a domed constellation of blue lights, with numbers glowing and blinking in the darkened space.